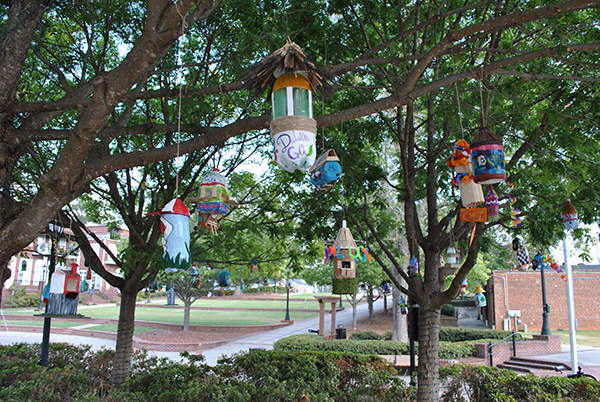 The students of SKA Academy created beautiful Duluth-inspired birdhouses and wind spirals out of recycled materials. Artists ranged from kindergarten through high school students. SKA students, parents and staff presented the pieces at the September DPAC meeting before hanging the temporary installation for the month of October. Special THANKS to those who participated! Members of the Duluth community were notified via social media of the pop-up mural event in downtown Duluth during the City's 2016 Art Week. The result is spectacular! We hope to provide more opportunities for community-art-creations in the future. Check it out for yourself: the mural is located in the parking lot behind the Festival Center (off of Hill Street). Interested in creating a public art project in Duluth? Contact DPAC@duluthga.net.